↑ 立川京一 1999, pp. 43. ↑ Jean-Philippe Liardet, L'Indochine française pendant la Seconde Guerre mondiale Archived 5 February 2012 at the Wayback Machine. 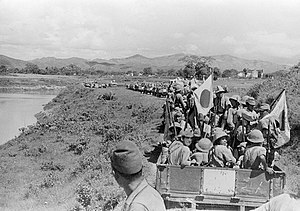 "Occupation of French Indochina", Nippon News, No. 18. in the official website of NHK. หน้านี้แก้ไขล่าสุดเมื่อวันที่ 1 เมษายน 2562 เวลา 13:01 น.